I was hanging with some musical friends this week, watching an old video of theirs, relaxed and routine, when – boom! – four minutes in heaven. The Real Group. Margareta Bengtson. 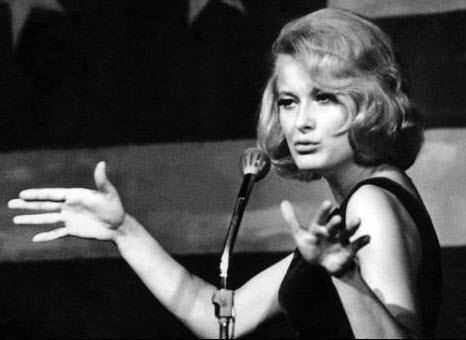 Monica Zetterlund. 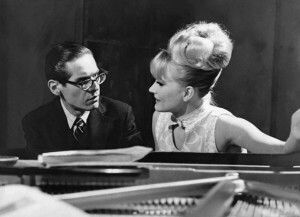 Bill Evans. Let me explain. But I’ll probably get all historical and detailed way beyond what any normal person would care about. So unless you have the patience of a stone, feel free to listen, watch, and be transported. The Real Group, ‘Monica Vals’. In 1953, Bill Evans (1929-80) was released from the army. He’d finished a degree in classical piano at Southeastern Louisiana College and was trying to decide which direction to pursue, classical or jazz. So he took a year off, living in his parents’ home and practicing. He would visit his brother Harry (who eventually became a music professor and a suicide; here’s an mind-opening interview by Harry of Bill from 1964, very much worth studying) and his three-year old niece Debby. ‘Waltz for Debby’ has become a jazz classic, written mostly in ¾, not a common jazz signature. It’s charming, disarming, lovely and tender. It’s the genius that is Bill Evans at his best. Evans included it on his first album, “New Jazz Conceptions” (1956), a solo performance. Perhaps his finest treatments of it were on his masterpiece recording “Live at the Village Vanguard” (1961), with Paul Motion on drums and the immortal (but fated to die 10 days later) Scott LaFaro on bass. Here’s Take One and Take Two. Here’s a posting dedicated to that session, one of the most sublime pieces of music I’ve encountered. Evans played ‘Waltz for Debby’ throughout his career, right up to the end – here it is from 1980 (with Joe LaBarbera on drums and Marc Johnson on bass), exactly one month before his tragic but inevitable death. Well, aren’t all tragic deaths inevitable? 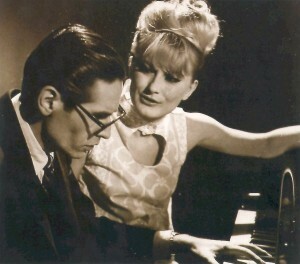 The song is usually performed gently (1956, 1961). Here in 1980, on the edge of the abyss, he invests in it a frightening passion that I discussed at length in a blog post about another signature song of his, ‘Nardis’. In 1963, Evans asked his friend Gene Lees to write lyrics for the song. Some people think they’re precious and wonderful, some think they’re painfully kitsch and demean a perfectly restrained song. Me? I’m so caught up in the music I don’t even hear them. In the summer of 1964, Evans made his first trip to Europe, with his second trio – Chuck Israels on bass, Larry Bunker on drums. In Sweden he met a young singer named Monica Zetterlund (1937-2005), who had made a recording of ‘Waltz for Debby’ with lyrics by Beppe Wolgers, ‘Monica Vals’. They cut a wonderful album together, a paragon of passionate restraint (Evans) meeting icy perfection (Zetterlund). Here’s the recording, and here’s a TV video of that visit. While we’re here, here’s a beautiful ‘Some Other Time’ video from the same program. And here they are doing a beautiful, relaxed rehearsal of ‘Monica Vals’ two years later, with Eddie Gomez on bass and a Swedish drummer. 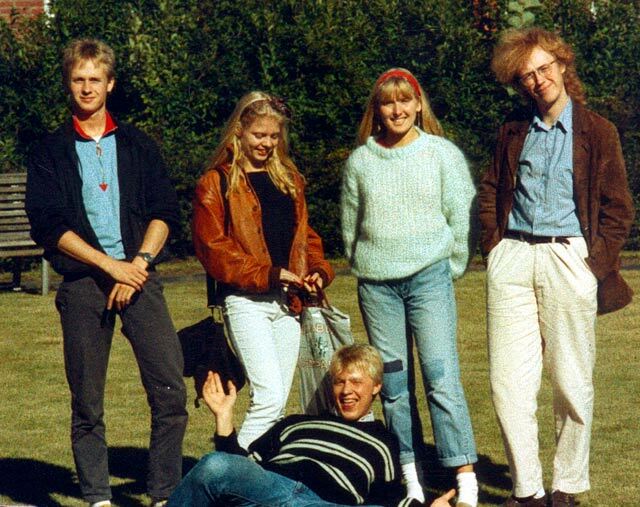 In 1984, five Swedish friends were at studying together at the Royal Academy of Music. 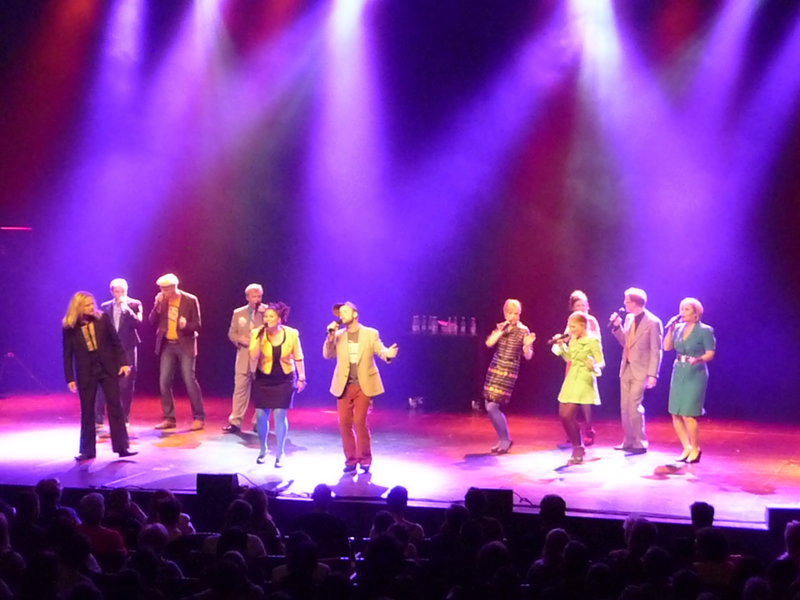 They felt that other friends played all the instruments and styles better than they did, so they decided to try something different – singing jazz classics a cappella. Thus was born the genre I love so well, ‘modern a cappella’. They began by listening to classic jazz such as Count Basie/Quincy Jones and replicating it vocally, each voice singing a different instrument/part, resulting in a pure, breathtaking polyphony. A couple of their earliest efforts were arrangements by Peder Karlsson of early Evans’ tunes: ‘Very Early’ and ‘Monica Vals’. 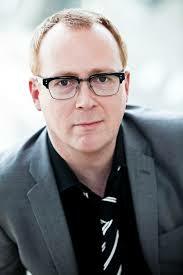 Here’s an extensive interview I had with Peder describing the riveting metamorphosis of the group. And finally – our Song of The Week, our Performance of The Week, our four minutes of heaven of the week: The Real Group performing ‘Monica Vals’, live in Stockholm, 2005. The soloist is the original soprano, Margareta Bengtson, who left the group in 2006. Scott LaFaro’s bass part written by Peder for Anders Jalkéus; the intricate, marvelous tapestry of Katarina Henryson, Anders Edenroth and Peder – this is as good as it gets. And Margareta’s solo is a simply a wonder of the world. Such precision, such love, such delicate charisma. Here’s their reunion performance of ‘Monica Vals’ from The Real Group Festival in Stockholm, 2012, which I was blessed to be present at. If you hear someone in the audience crying from utter bliss, that just might be me. I’ve been fortunate enough to get to know all the members of The Real Group to varying degrees. Some are warm acquaintances, some dear friends. It’s a unique experience for me to know people to whom I both feel close personally and also admire so profoundly as artists. Hey, Margareta, how are you? When I heard and saw you singing ‘Monica Vals’ this week, in my mind I gave a slight bow and kissed your hand. I don’t know how else to thank you for touching my ears and my mind and my heart so wondrously. When they say ‘The voice is the only instrument made by God’, this is what they’re referring to. I just can’t imagine anything more perfect. Four Swedes and a Dane recently climbed up on bar stools in a living room with a few friends in Södermalm, Stockholm. What the big deal? They’re The Real Group, the best singing group in the world; they sang ‘Nature Boy’ breathtakingly, with an exquisite lead by Emma Nilsdotter in an inspired arrangement by Anders Edenroth; it was filmed with impeccable taste; and the result is just a little perfect. 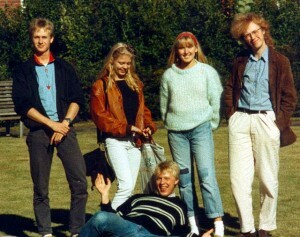 The Real Group honed their a cappella jazz skills in the late 1980s as five buddies doing their academy studies together in Stockholm. They invented their own academic program, and a whole new take on group jazz singing. Inspired more by Bobby McFerrin’s restrained virtuosity than by Manhattan Transfer’s brash, brassy showiness, they reworked Count Basie arrangements in a five-voice context and sparked an entire musical movement, Contemporary A Cappella, with luminaries such as Rajaton (Finland), Vocal Line (Denmark), The Swingle Singers in their current very hip incarnation (UK), The Idea of North (Australia), and even obliquely Take Six (US). Here’s a SoTW I wrote about The Real Group a while back, with lots of links to their music. 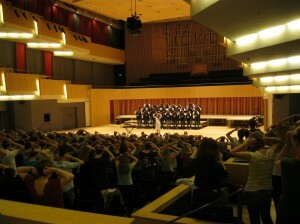 Contemporary a cappella may be a small movement compared to hip-hop or trance, but its devotees are passionate and growing in numbers. And we all know what passionate cults are capable of. I’m flying this week to my third congregation of cultists, the second this year, at the Aarhus Vocal Festival in Denmark. As unique an experience as Woodstock was (yes, I was there—the Forrest Gump of musical fests), we hippies tended to stare at each other in bewilderment. Here it’s all hugs and grins and a sincere sense of brotherhood in harmony. Much of this warmth is due to The Real Group themselves, because they’re warm, personable, down-to-earth people. Remember how everyone copied The Beatles’ mop tops? TRG’s modesty has become the currency of our genre. After twenty-eight years, The Real Group is still going strong (albeit with two changes from the original line-up). In recent years they’ve moved more towards original material – for example, ‘Pass Me the Jazz’ (the next clip to be released from the same session as ‘Nature Boy’); fine as it is, it’s a special pleasure to return to the Great American Songbook and one of its more unusual luminaries, ‘Nature Boy’. 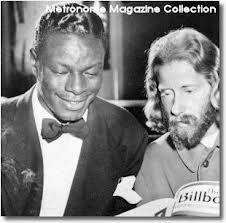 In 1947, a short, barefoot man with shoulder-length hair on a bicycle pushed a tattered score into the hand of Nat ‘King’ Cole’s manager, Mort Ruby, backstage at a theater in LA. Cole liked the Yiddish flavor and intriguing lyrics of the little song and began playing it in his shows. It went over very well, so he wanted to record it. Go find the composer in order to get the rights to the song. Nat Cole (1919-1965) led a very successful jazz trio in the 1930s and 1940s as the pianist. The apocryphal story is that one night a rowdy drunk insisted that Nat sing ‘Sweet Lorraine’, it caught on, and he began singing more and more. His first hit was in 1943, ‘Straighten Up and Fly Right’, which Bo Diddley credited as being a precursor of rock and roll. And Bo Knows!! In the late 1940s, Nat cemented his move from jazz piano to popular vocals – ‘The Christmas Song’ (Chestnuts roasting on an open fire), ‘Mona Lisa’, ‘Unforgettable’, ‘Too Young’ and of course ‘Nature Boy’. But first we have to find that long-haired guy. Alexander Aberle was born in Brooklyn in 1908 to a Jewish father and Scottish mother, grew up in a Jewish orphanage till he was adopted at age 9 by a couple from Chanute, Kansas, who changed his name to George McGrew. 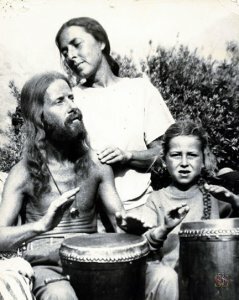 He worked in obscurity as a pianist and dance band leader till he got his breakthrough gig in LA in 1941— playing at a small health food store and raw food restaurant owned by a couple of German immigrants, adherents to the Lebensreform lifestyle of health food/raw food/organic food, nudism, sexual liberation, alternative medicine, and abstention from alcohol, tobacco, drugs, and vaccines. Alexander/George renamed himself eden ahbez (‘only the words God and Infinity are worthy of capitalization’), but his friends called him ahbe. 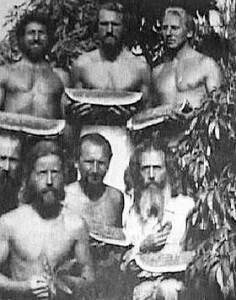 Together with wife Anna Jacobsen, their son Tatha Om and another dozen ‘tribesmen’, ahbe and The Nature Boys (recognize that name?) lived off the land in Tahquitz Canyon near Palm Springs, slept in caves and trees, and bathed in waterfalls. They prided themselves on subsisting on under $3 a week. 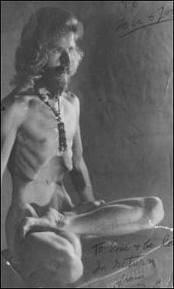 The Nature Boys are today widely perceived as the precursors of the Hippie movement. Except for the bathing part. One of the other notable Nature Boys was Gypsy Boots, aka Robert Bootzin. His health food store “Health Hut” was the first of its kind in the world, a celebrity hangout in the early 1960s. He invented his own renowned garlic cheese, the natural smoothie and the organic energy bar, cheered wildly at all USC football games, marched in parades, and swung from a vine on network TV shows – Groucho Marx, Spike Jones, and (25 times) The Steve Allen Show. His non-nature buddies included Marlon Brando, Jay Leno, Paul Newman and Muhammad Ali. Here’s a fascinating clip from a 1948 TV show, in which ahbe explains how he came to write ‘Nature Boy’ and then meets Nat Cole for the first time, live before the cameras. Well, kind of. 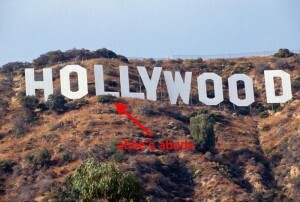 ahbe lived in relative obscurity (I guess under that “L”), eating nuts and being healthy. 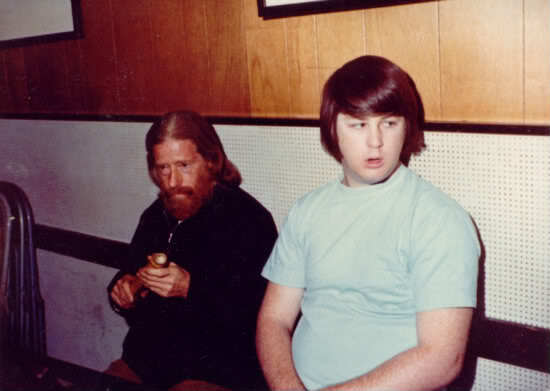 Incredibly (or maybe not, when you think about it), he’s shown in this photo with Brian Wilson during the recording of “SMiLE”, just before Brian’s breakdown. ahbe recorded a couple of albums including songs like Eden’s Cove, which is somewhere between Martin Denny and Wild Man Fisher. If you listen to the break at 1’10” you may really grasp the key to Brian Wilson’s mind and the meaning of the universe. As well as the taste of the garlic smoothie. He died in 1995 at the age of 86 in a car accident. It’s really not much more than an extended introduction. To tell you the truth, it’s hard for me to explain its tremendous appeal. When those icy Swedes start talking about that Yiddish kvetch, I just melt. In Anders’ arrangement, after the initial AB, at 2’26”, the group opens the song into a Nordic expedition into the Heart of Yiddishism, an immaculate union of the pristine and the passionate. Bernard Malamud, one of my favorite authors, said “All men are Jews, though few men know it.” He explained this famous statement as “a metaphoric way of indicating how history, sooner or later, treats all men,” meaning I think that the default experience of Jews is suffering, that all individuals at some point in their lives are touched by the same suffering that has been the fabric of Jewish history. 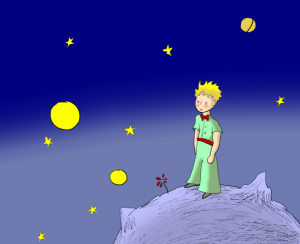 This is the background that informs Yiddish melodies. When ‘Nature Boy’ became a hit, a Yiddish musical composer, Herman Yablokoff claimed that the melody to “Nature Boy” came from one of his songs, “Shvayg mayn harts” (“Be Still My Heart”). ahbe retorted that he “heard the tune in the mist of the California mountains.” They settled out of court for $25,000. No recording of Yablokoff’s song is known, but here’s another Yiddish song with the same title, about a blind Jewish orphan boy selling cigarettes and matches in the ghetto of Grodno during WWII to stay alive. If you look at a map, Grodno in Belarus really isn’t that far from Sweden. It’s also interesting to note that the first two measures of the melody of ‘Nature Boy’ parallel the melody of the second movement of Antonín Dvořák’s Piano Quintet No. 2 in A, Op. 81 (1887). What do you have to say about that, Mr Yablokoff? Are you going to sue Dvořák? ‘Nature Boy’ clearly strikes a resonant chord. Following Nat Cole’s hit, it immediately became a fallback vehicle for unbridled emotion in the Great American Songbook. Here’s Nat Cole’s hit version of the song, but the orchestra gets a bit carried away, and I’d recommend this live version from 1948. Some of the notable early treatments of the song from the 1950s are those by Frank Sinatra, Ella Fitzgerald, Sarah Vaughan (in a rare dud) and Miles Davis. But the song has proven to be immensely popular in a wide variety of settings, sometimes more successfully, sometimes less so. Interesting versions that I recommend skipping are those by David Bowie (bombastic), James Brown (unfortunately I could only find an audio version), Grace Slick (in her pre-Airplane incarnation, The Great Society), and Lisa Ekdahl (no Yiddish pathos there). The great jazz singer Mark Murphy starts out great but inexplicably chooses to take the song to Trinidad (no Yiddish pathos there, either). Two excellent vocal groups, Singers Unlimited (1975) and Pentatonix (2012), show by contrast just how fine an accomplishment is that of The Real Group. A few versions that are worth checking out for their own distinctive merits are that by Nataly Dawn, a very talented young indie artist; and Radka Toneff, who’s always fine, but who doesn’t squeeze the song the way The Real Group’s Emma does. Perhaps the most pleasant surprise I discovered is Lizz Wright, a singer I’ve long admired, in a drum duet. I don’t know how much it has to do with the essence of the song, but it’s one fine, intense piece of music. Two singers get special mention. Surprisingly, Cher. She sang it in a 1998 TV tribute to her late husband Sonny Bono, calling her grief “something I never plan to get over.” She’s clearly singing from the heart of her heart, and ‘Nature Boy’ is clearly a chillingly apt tribute to him. And, unsurprisingly, the great Kurt Elling. ‘Nature Boy’ is a signature song of his. He goes through the song once in a traditional take, then flies off into spheres of unparalleled scatting virtuosity, egged onwards and upwards by pianist Laurence Hobgood, an utter tour de force. Here’s his studio version, and you can find many fine live versions here. And just in case you’d like to join the list, here’s a karaoke version. Send in your recordings to SoTW, we’ll be glad to post them. For my money, with all the credit to all the fine artists who’ve recorded the song over the years, I’m going to stick with The Real Group. This is what our contemporary a cappella can be: just a little perfect.